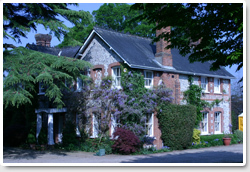 The Village features 14 Locally Listed Buildings. See the list below. In addition to the Statutory List of Grade I,II and II* buildings which is compiled and maintained by the Department of Culture, Media and Sport (DCMS), Guildford Borough Council (GBC) has a list of buildings of special local architectural or historic interest. This is known as the "Local List". Although a building doesn't have any more legal protection if it is on this Local List, the list helps GBC to exercise control over any changes to these buildings and to make sure that the special interest of these properties is not lost. Buildings or structures, dating before 1840 which survive in anything like their original condition. Buildings dated between 1840 and 1914 that have a definite quality and character. The use of local styles is particularly relevant when we determine the value of such a building. Buildings dating between 1914 and 1939, which have a particular quality, character or are of local significance. After 1939, outstanding buildings which represent an important architectural style. The work of recognised local architects, builders and engineers or buildings which are good examples of local town planning. Examples of identifiable building traditions, techniques and materials that form part of the vernacular or local architectural style. Buildings, which have a landmark and/or group value which contributes to local distinctiveness. Buildings with special historical associations, local or national. Historic buildings of strong architectural interest affected by minor reversible alterations. Buildings that have been documented in recognised publications, for example, 'Pevsner', or have received an architectural or planning award. Locally Listed Buildings do not have any additional statutory protection. However, inclusion on the Local List is a material consideration when planning proposals are determined. GBC encourages owners to meet the same principles of conservation and good design that is applied to statutory listed buildings. Buildings of historic significance once lost cannot be replaced and the whole or partial demolition of a Locally Listed Building will be opposed, as will the removal of important external or internal features. Alterations or extension should enhance the character of the original building and special consideration will be given to the importance of maintaining the building's historical and architectural integrity. The setting of a Locally Listed Building will also be taken into account when considering related development proposals and GBC protects these buildings through their local plan policies. Locally Listed Buildings could be eligible for grants towards repairs including the reinstatement or replacement of prominent external features. For more information visit the GBC website. 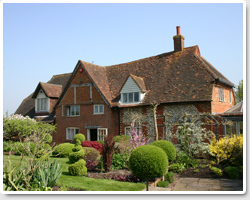 In East Clandon many of the Locally Listed buildings were designed and built by Captain H S Goodhart-Rendel. 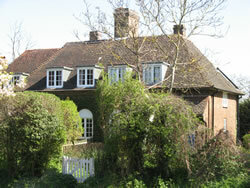 Captain Goodhart-Rendel lived at Hatchlands until his death in 1959. He was president of the The Royal Institute of British Architects (RIBA) and of the Automobile Association. (AA) In 1955 he received a CBE for services to architectural criticism. His most famous building is Hay’s Wharf, on the South bank, London. 1947. A row of four cottages built in 1947 by Captain H S Goodhart- Rendel. Constructed in chevron bonded red brick with plain tile sweeping roof. Part hipped gables to each end. A central two storey section breaks the eaves line with hipped roof and gablet over. Passageway to rear in centre with stone lintel. Originally four tall stacks, now only three remain. Although upper floor windows are featured on all four cottages only the centre two originally had upstairs rooms. All windows to the front elevation are timber casement; large main windows are four light, four pane design. All other windows three panes high. 1914. 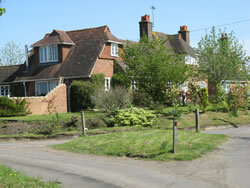 A pair of semi detached cottages built in 1914 designed by Captain H S Goodhart-Rendel. Built in stretcher bonded brick with pantile mansard roof. Two storey main section with single storey arms to rear. Short stack on ridge for each cottage. Large timber multi-pane sash windows to ends, with brick lintels over. Originally single dormer to front elevation, two large timber multi-pane sash windows at ground floor. Number two remains much the original condition, whereas Number one has had many alterations that have been detrimental to the symmetry of the pair. C19th. A large house built in the mid to late C19th in flint with red brick dressings. Pitched slate roofs with two gables to front and narrower central bay. Tall narrow stack right; shorter stack to left. Two storey with single storey extension to left. Flat roofed porch supported by two plain square columns narrowing towards to top. 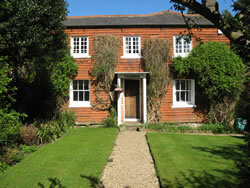 Timber sash windows throughout. 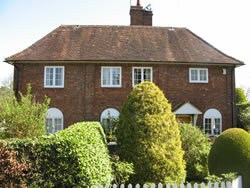 To front gables ground floor, three two light, six pane sash windows, with brick surrounds and shallow brick arch over. To first floor, central bay, two smaller four pane timber sash windows. Decorative brick banding running between floors. c.1500. A large house built around 1500 with additions in 1716. Timber framed construction with brick and flint infill. 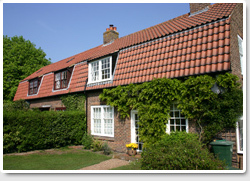 Large plain tile, hipped roof. Two main ridge stacks. End portions tile hung, Varying fenestration though all leaded lights. Single storey section to front. Originally built as a single house, split into semis then returned to a single house in 1928 at which time brick infill was replaced and new timber sections added. Previously a Grade III building. c.1550. Built around 1500 and extended at later dates. Previously a Grade III building. 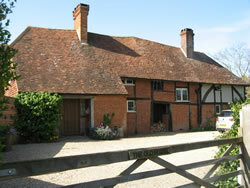 Timber framed with brick and flint infills. Main section has a hipped, plain tile roof with gablets. Pitched bale to centre of front elevation with dormer to either side. Two storey throughout. Small ridgestack to left, more substantial stack to right of front gable. Most windows to front and side are timber casement; leaded light windows. 1921. 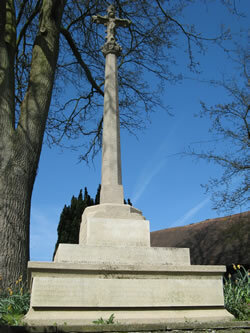 Designed by Captain H S Goodhart-Rendel in 1921/2 on behalf of East Clandon Parish Council. Built in stone. Large angular base made of three sections with writing inscribed. Main post with chamfered sides to form octagonal shape narrowing towards figure of Jesus upon the cross at the top. 1910. A pair of semidetached houses built in 1910 by Captain H S Goodhart-Rendel, in purple Guildford Park facing stocks with hand made plain tiled roof. Two storeys. Two joined stacks in centre of ridge both with dentil course. Assymetrical layout, with one entrance to three bay ‘front’ and the other to two bay ‘end’, both entrances with pitched timber porch over. Bays divided by brick pilasters, top brick course under eaves turned through 45 degrees. To ground floor, two light, six pane timber casement windows under semicircular brick arches. To first floor mix of two light, six and four pane timber casement windows. 1910. A pair of semidetached houses built in 1910 by Captain H S Goodhart-Rendel, in purple Guildford Park facing stocks with hand made plain tiled roof. Two storeys with extension to left (north). Originally a symmetrical layout. Two narrow stacks to rear, one larger on roof top, one smaller end stack to extension. Low roofline has four small dormer windows to original frontage and one to recessed extension. Four timber sash windows under semicircular brick arches. To rear, original doorways with two brick arches over each one now modified to form a porch. 1863. 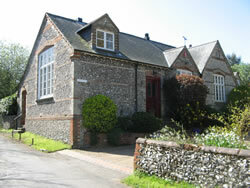 Built in 1863 and closed as a school in 1969now with some later additions. Faced in flint with red and buff brick dressings. Pitched slate roof with gables to side and front. Narrow stack on rear elevation; dormer windows to fromt and rear elevations. 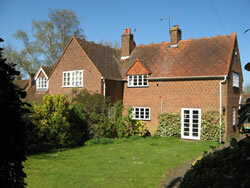 To front elevation large timber windows with angular arch over, in alternating brick. Decorative dentil course running parallel with gable window and door surrounds in buff coloured brick intersected by various string courses. 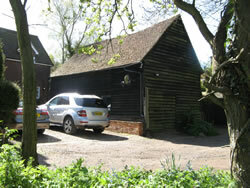 C17th Barn, now a garage/garden store. Formed part of the Hatchlands Estate. Pitched plain clay tile roof; dark stain weatherboarding on flint plinth wall. Modern extensions to right hand side. Side hung timber doors to left front. Small plain window to east elevation. 1947. A pair of six roomed semi detached houses. Built in 1947 by Captain H S Goodhart-Rendel. Built in red brick chevron bomd, with mix of plain and ‘fishscale’ roof tiles, on pitched roofs to create a diamond pattern. Assymetric design originally intended to appear as one large house, now extended to rear corner. Two stacks, one to front and one to centre of ridge. Windows all timber casements with horizontal emphasis on proportions, originals being one pane wider than they are tall. Barn to rear. Early C19th. Probably early C19th. Much extended to rear. Completely plain tile elevation, shallow pitched slate roof, hipped roofs to rear. Small stack on ridge to right. Flat roof porch over door to centre front. Two large deeply recessed, six pane timber sash windows to ground floor. Three casement windows to first floor. 1947. Cul-de-sac of cottages built in 1947 designed by Captain H S Goodhart-Rendel. Built in chevron bonded grey brick with red plain tiled roofs. All five pairs of semi detached cottages are two storey and have pitched roofs, some continuing over single storey elements. Each cottage has a plain rectangular stack. Two pairs based on symmetrical design, the other three are based around asymmetrical L-shaped plans with additional single storey sections. 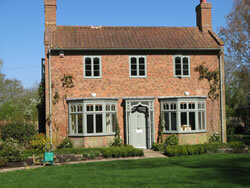 Timber windows have strong horizontal emphasis with high sill level. 1950s. The Close, originally known as Gardeners Cottage was built in the mid to late 1950s by Captain Harry Stuart Goodhart-Rendel (1887-1959) for his gardener. It was built on the grounds of the Hatchlands Estate and the original plans show flint infill with brick details to the exterior of the building with shaped window heads to the first floor. 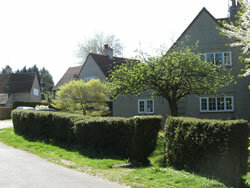 The Village also features 25 Statutory Listed Buildings.